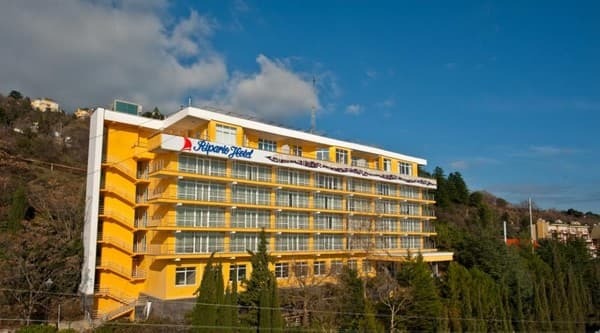 The spa resort «Ripario Hotel Group» is located four kilometers from the center of Yalta in the village of Otradnoe. More than 10 hectares of charming territory, framed by the sea, the park, the tops of the mountains, and next door is the Nikitsky Botanical Garden. To the services of the guests of the Ripario Hotel Group 205 cozy, comfortable rooms from the class "Econom" to the class "Suite" and "Apartment", from the windows of which a wonderful panoramic view of the sea and mountains opens. The rooms are located in separate buildings located in the immediate vicinity of the sea in the shadow of the relic trees of the ancient park. In 2010 the "Modern" building was completely reconstructed in accordance with all modern requirements of comfortable rest and high-quality service. The infrastructure of the Ripario Hotel Group includes a park, a beach, its own embankment, a medical center, a SPA-clinic, a pump room with unique healing water, a fitness center, an indoor heated pool, a sauna, a lobby bar, Ros Marinus restaurants and "Ripario Modern", cafe "A More Bar", dance and concert area, table tennis, tennis court, mini football field, shop, currency exchange office (in summer season), children's playroom (in summer season), children's playground , a luggage room, safe deposit boxes at the reception, paid parking, an auto-camping, 5 conference rooms for s, banquet facilities, a meeting room. Distance to the sea - 150 m. PRICES MAY CHANGE, IT IS REQUIRED TO RECEIVE INFORMATION FROM THE OPERATOR. Description of the room: This room measures 11 sq.m. The room has one queen-size bed, refrigerator, TV, wardrobe, bedside table, armchair, bathroom with shower. 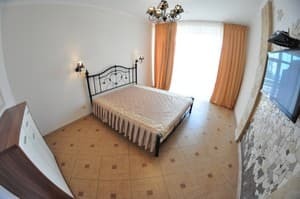 The room is suitable for one person or for relaxation together with a small child. Description of the room: This room measures 12.5 square meters. In the room there are two single beds, a refrigerator, a TV, a wardrobe, a bedside table, a bathroom with a shower. Description of the room: The room with a balcony and sea view is located in the second building. The area is 15 sq.m. The room has two single beds, a coffee table, a wardrobe and a refrigerator. 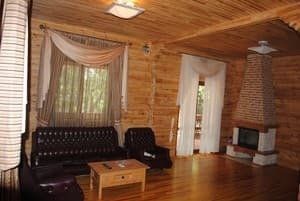 Description of the room: Double room with a mountain view, total area of ​​19 sq.m. 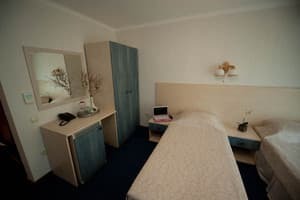 The room has two single beds, plasma TV 29`, mini-bar, cupboard, safe, kettle, bathroom with shower, mini perfumes, hairdryer, bathrobe, slippers. Description of the room: Bright, sunny room with air conditioning, south side. Room size is from 15 to 20 sq.m. The room has two single beds, a coffee table, a wardrobe. 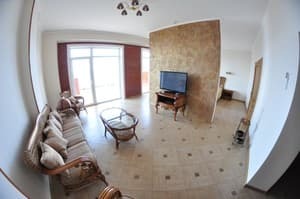 Description of the room: Spacious room with a total area of ​​37 sq. 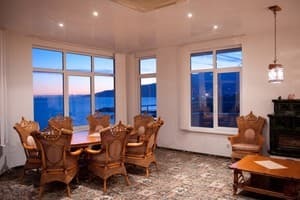 M, from windows there is a magnificent view of the sea and shining Yalta. 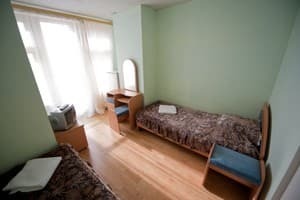 In the room there is one double bed or two single beds, a sofa, a 32 "plasma TV, a wardrobe, a minibar, a kettle, a safe, a bathroom with a shower, mini perfumes, a hairdryer, a bathrobe and slippers. 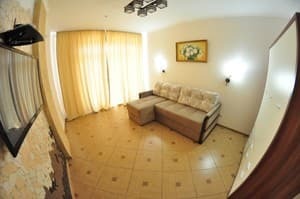 Description of the room: A spacious one-room apartment with an area of ​​22 sq.m. The room has two single beds, coffee table, wardrobe, balcony, air conditioning. Description of the room: One-room apartment on the 1st floor, total area 36 sq.m. A spacious bright hallway. A modern equipped kitchen with woodwork, with necessary kitchen equipment and a set of dishes. Bathroom with shower, mini perfumes, bath accessories, bathrobes, slippers. In the room there is a double bed, a wardrobe, a chest of drawers, a bedside table. Terrace with rattan furniture. Panoramic view of the open sea, mountains, Yalta. Description of the room: Located on the 1st floor of a 5-storey villa D3-D4. The total area is 44.3 sq.m. Terrace with rattan furniture (10.5 sq.m). Panoramic view of the sea, mountains, Yalta. Two-room apartment with a spacious entrance hall, living room, kitchen, bedroom, bathroom. Description of the room: Luxury apartment on the first floor of the new building. Panoramic windows overlooking the sea, access to the embankment. Living room-studio with equipped kitchen, bedroom, bathroom. 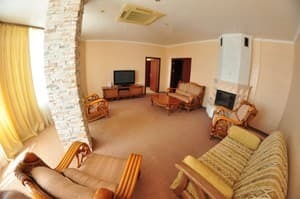 Description of the room: Two-room apartment of 90 sq.m with two bedrooms. There is a billiard table in the lobby. The apartments are equipped with comfortable and refined furniture. For the convenience of guests there is a kitchen (cooker, hood, dishes). 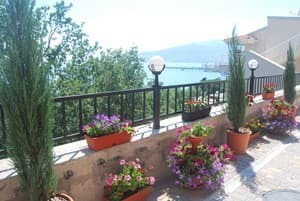 The balcony offers a panoramic view of the sea and Yalta. Description of the room: Two-room apartments are located in a separate two-storey house in the park. The area is 120 sq.m. The first floor can accommodate a nanny or guard. The apartments are equipped with comfortable and refined furniture. 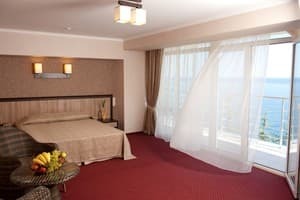 The balcony offers a panoramic view of the magnificent sea and shining Yalta. Description of the room: Located on the 2nd floor of a 5-storey villa D3-D4. The total area is 86 sq.m. Terrace with rattan furniture (20 sq.m). Panoramic view of the sea, mountains, Yalta. Three-room apartment with a spacious living room, kitchen, two bedrooms and two bathrooms: 1st bathroom with bath, 2nd with shower. Description of the room: Located on the 1st floor of a 5-storey villa D3-D4. The total area is 100 sq.m. Terrace with rattan furniture (20 sq.m). In the apartments there is a spacious living room, kitchen, two separate bedrooms, three bathrooms: in the bedrooms with a bath, in the hallway with a shower. Panoramic sea view. 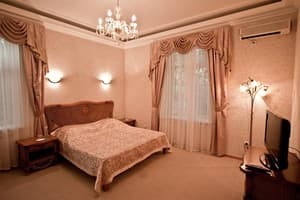 Description of the room: Three-room apartment 195 square meters with two bedrooms. For the convenience of the guests there is a fully equipped kitchen (cooker, extractor, dishes). The apartments are equipped with comfortable and refined furniture. Description of the room: Two-storey cottage in the center of the park. Three bedrooms, living room, kitchen (electric stove), patio with barbecue. Each bedroom has an exit to a private balcony (50 sq.m). 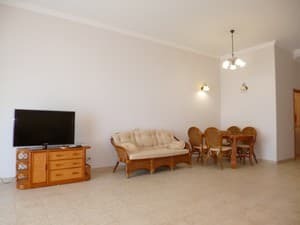 Description of the room: Two-bedroom apartment of 240 m2 with two bedrooms. There is a billiard table in the lobby. 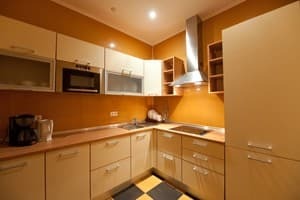 For the convenience of the guests there is a kitchen (cooker, hood, oven, dishes). The apartments are equipped with comfortable and refined furniture. 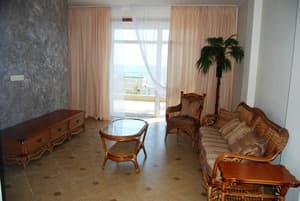 The balcony offers a panoramic view of the magnificent sea and shining Yalta. Description of the room: Located on the 2nd floor of a 5-storey villa D3-D4. The total area is 100 sq.m. Terrace with rattan furniture (20 sq.m). The apartment has a spacious living room, kitchen, three separate bedrooms, two bathrooms: 1st bathroom with bath, 2nd with shower. Panoramic view of the sea, mountains, Yalta. 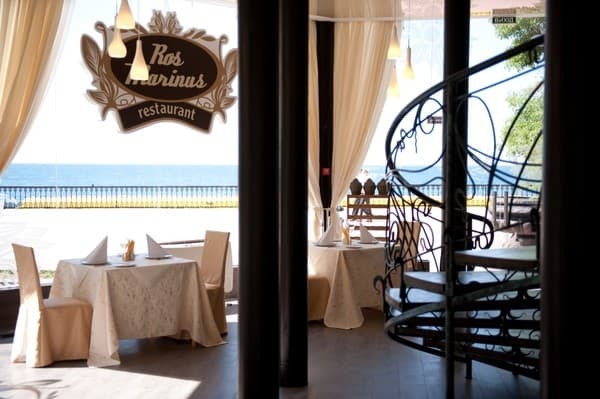 Description of the room: Detached cottage, which is located in front of the waterfront near the restaurant "Ros Marinus". The total area of ​​the cottage is 241.5 sq.m. It has 5 bedrooms, 3 bathrooms, a living room, from the rooms there are exits to the balcony, your yard with a barbecue, a pond and an arbor. The atmosphere in the house, filled with the aroma of coniferous trees and woods, sunny warm tones of wooden walls and furniture, a fireplace, will not leave guests indifferent. The kitchen is equipped with a stove, oven, extractor fan. Children are accepted from any age. Up to 5 years (with parents) accommodation and meals are free of charge, from 5 to 12 - 50% of the cost of additional space (specify at the time of booking). 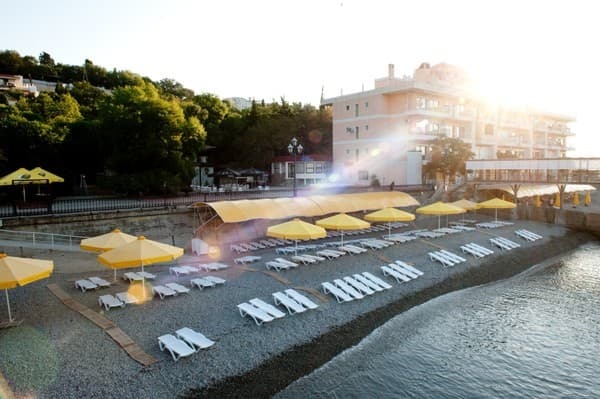 The resort complex "Ripario Hotel Group" is located four kilometers from Yalta in the village of Otradnoe, on the Black Sea coast (150 m), on the magnificent Massandra beaches (the former boarding house "Pribrezhny"). Distances from the complex to the railway station of Simferopol - 80 km, Sevastopol - 95 km. To Simferopol Airport - 89 km, to the bus station of Yalta - 4 km. The medical center allows to pass a number of diagnostic and improving procedures. KME - Medical Expert Complex (Switzerland) - one of the most effective methods of diagnosis and treatment of diseases of the human body, allowing to conduct diagnostics in a variety of directions with the subsequent treatment of identified pathologies. The CME makes it possible to identify a wide range of causes of diseases - simultaneously to examine all the organs and systems of the patient, revealing not only a general violation in them, but also a specific zone of the process location. In the medical center, you can also go through an ultrasound and a series of treatment procedures for the appointment of a physician-therapist. "Ripario Hotel Group" offers a wide range of SPA and honey. programs on aesthetic medicine, balneotherapy, general health promotion. From the clothing market of Yalta or from the colonnade of the Nikitsky Botanical Garden, the route number 34 to the stop "Pension Pribrezhny".